Have you ever heard of the digestive system? The lymphatic system? How about the muscular and nervous systems? Of course you have. Science has been studying them for years, making breakthroughs in our understanding of their inner workings that have lead to advancements benefited humanity in ways we now take for granted. Obesity, diabetes, symptoms stemming from cancer, atherosclerosis, Multiple Sclerosis, Glaucoma, Infertility, Neuropathic Pain, Neurodegenerative diseases (such as Parkinson’s, Alzheimer’s, and Dementia), Post Traumatic Stress Disorder (PTSD), Menstrual cramps, Neuralgias, Insomnia, Anorexic wasting syndrome, chronic pain, muscle cramps, anxiety, nausea, inflammation, AIDS related weight loss, Tourette’s syndrome, tremors, dystonia, Epilepsy, Arthritis, depression and other mood disorders, alcohol and opiate addiction, etc. (there are many more). ….Can I sneak in its possible involvement in cognitive function and creativity? Schafer and colleagues (2011) reviewed literature and concluded that its activation leads to connecting seemingly unrelated concepts, an aspect of divergent thinking considered primary to creative thinking. At this point I assume many are in disbelief. You are likely wondering how such an important bodily system that permeates the entire body, plays a vital role in physiological functioning, and as the potential to treat such a wide variety of ailments and diseases has not received further attention and/or recognition. Well, now I’m going to tell you why. Its because the endocannabinoid system is stimulated by cannabinoids. That includes those that are produced by our bodies (endocannabinoids), and those released while smoking, or otherwise consuming Cannibis (exogenous cannabinoids – aka. “Marijuana,” for those who know it by the popular, inaccurate name). Now I am not an Oncologist, nor an Internist for that matter. My specialty does not deal with the treatment of several of the conditions that I mentioned above. I am a manual therapist, physical conditioning, and sports specialist. As such, I am not writing this piece to highlight how research into this system, and its activation through exogenous cannabinoids (cannabinoids introduced from outside the body often through smoking or ingesting the cannabis plant) is proving beneficial for conditions outside of my scope of practice. I am writing it to highlight the involvement of this extensive bodily system in manual therapy and exercise as a result of being activated by the endogenous cannabinoids. When treating patients for musculoskeletal conditions such as lower back pain, neck pain, headache, osteoarthritis, sports injuries, etc., using manual therapeutic approaches, two of the main goals are to reduce pain, and remodel soft tissue structures. In the scientific literature, much time and effort has been put fourth in attempts to understand the mechanisms behind how treatment techniques can contribute to these goals. We now have some understanding about the role of several bodily systems including the central nervous system, peripheral nervous system, endocrine system, and the myofascial system. What about the endocannabinoid? Can this system also contribute? Preliminary research suggests that it can indeed. As noted by McPartland et. al in 2005 and 2008, the effect of soft tissue manipulation on the ECS affects fibroblast remodeling (and hence soft tissue remodeling), dampens cartilage destruction (thus preserving joint health), diminishes nociception and pain, and even reduces inflammation in myofascial tissues. This has been shown to occur specifically in subjects with chronic lower back pain following soft tissue therapy as per Degenhardt et al. (2007) who identified a significant alteration in the concentration of several circulatory pain biomarkers lasting for up to 5 days post-treatment. If physical manipulation by a manual medical practitioner can stimulate this important system, how about physical manipulation by way of movement and training? Does the ECS play a role in exercise? Research on this topic suggests that it does indeed. Exercise induces changes in mental status, pain levels, sedation, anxiolysis (anxiety levels), and a sense of wellbeing (Dietrich & McDaniel 2004). Many of these changes have been attributed to the “endorphin hypothesis” which was thought to, for example, produce the “runners high” (which I am sure many of you are familiar with). However, research on the exercise-endorphin connection has produced equivocal results. One of the main issues is that endorphins are too large to cross the blood-brain barrier (meaning they are not ‘allowed’ to leave the blood and enter brain tissue to produce the effect). In recent years, several prominent endorphin researchers including Dr. Huda Akil and Dr. Solomon Snyder, have publically criticized the hypothesis noting that it is “poorly supported by scientific evidence” and that it is a “myth perpetuated by pop culture” (Kolata 2002). Blood brain barrier: The protective barrier surrounding the brain that filters undesirable material from entering brain tissue. What then is creating this effect? Recent findings show that exercise increases serum concentrations of endocannabinoids, suggesting a possible explanation for a number of these mental, and physical changes. Both endogenous cannabinoids and plant cannabinoids are allowed to cross the blood brain barrier freely. To begin with, there is a large body of scientific literature documenting that exercise suppresses pain, induces sedation, reduces stress, and elevates mood (Dietrich & McDaniel 2004). It can also induce ‘Flow states’ (Csikszentmihalyi 1996) whereby the participant becomes so immersed in the activity that they have an altered perception of space and time. Similarly, a large body of evidence also demonstrates that the consumption cannabis, or marijuana, produces almost identical effects including sedation, pain reduction, reduced anxiety, euphoria, enhanced sensory perception, a state of silent introspection, altered time perception and feelings of wellbeing. This results from the fact that the psychoactive constituent of cannabis, Delta-9-tetrahydrocannabinol (THC) exhibits a high affinity for the CB1 receptor, which is densely expressed in brain regions implicated in the control of emotion and cognition (Glass et. al 1997). 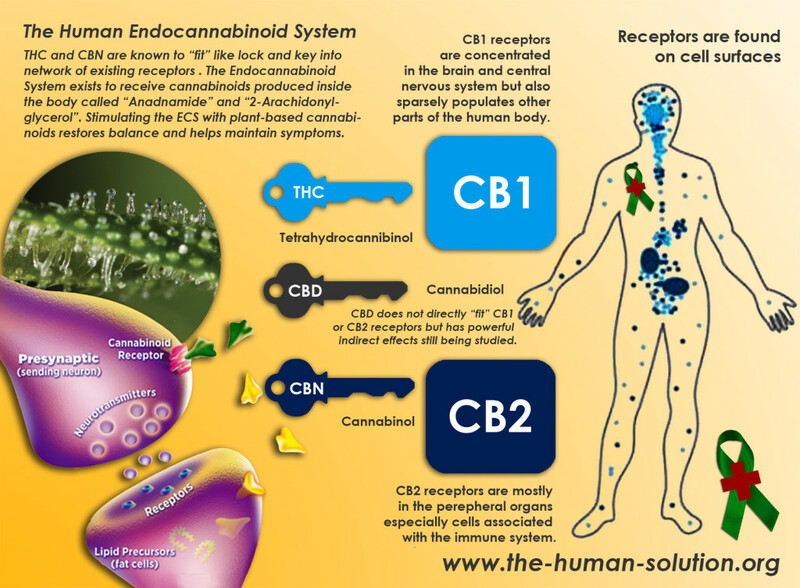 Both endogenous and exogenous cannabinoids function by the same mechanisms. The brains receptors accept both. Exercise increases our bodies’ production of its own cannabinoids. Therefore theoretically the state that one claims to achieve during running, the “running high,” is equivalent to a mild plant cannabinoid induced high. In addition to these mental changes, research also demonstrates the effect of ECS activation on creating various beneficial physical effects. For example, research looking at ECS stimulation has demonstrated its necessary involvement for the refinement of movements needed for coordinated locomotion (Steiner et. al 1999). 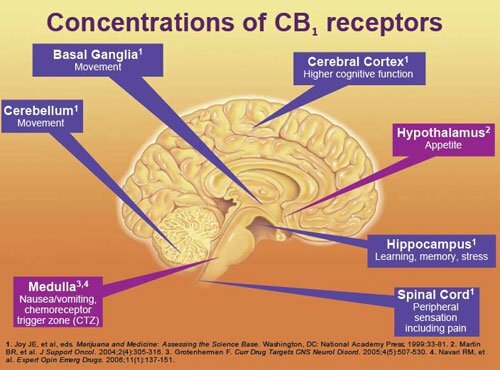 This stems from the fact that the highest concentration of the CB1 receptors in the brain are actually found in regions that control motor behavior and movement. This means that the majority of cannabinoid receptors are in the area of the brain that controls movement. Further, activation of the ECS may also produce beneficial peripheral effects (effects outside of the brain/central nervous system) leading to other adaptive responses to exercise including vasodilation (increased blood vessel size allowing for increased blood flow), and enhanced respiratory function facilitating improved breathing during exercise (Hillard 2000, Calignano 2000). As noted above, I wrote this simply to highlight the potential involvement of the endocannabinoid system in manual therapy, and its seemingly strong involvement on the mental and physical effects induced by exercise. In so doing, I hope to spark the interest of those in my field so that continued efforts are made through research to further understand how the ECS mediates the effects of manual care and exercise, as well as to potentially learn how to better manipulate this system to benefit our patients/clients. I am personally very interested in knowing if it is possible to activate the endocannabinoid system prior to exercise, or if it is possible to increase the responsiveness of the receptors. For example, could meditative practice do it? (Those who achieve meditative states also describe incredibly similar experiences. Perhaps meditation also acts on the ECS?). I am also interested in the mechanism it plays in teaching movement tasks to my training clients. Further, as a manual therapist, I am interested to know more about how this system is involved in tissue healing and remolding, pain modulation, and neural rehabilitation. At the moment, research on this topic is still in its infancy because of the difficulties involved in conducting studies including governmental regulations, as well as fear on the part of the researchers of being deemed ‘fringe.’ As social beliefs continue to change for the better, I hope that manual therapists and exercise specialists follow in the footsteps of oncologists and spend time learning about and understanding this often forgotten physiological system.